The Nak or Mangkorn Lennam Nanachart (International Naga or dragon) Pavilions are located at the entrance to Wat Yanasangvararam, on the bank of the Klong Ban Amphoe water reservoir. The pavilions were built in honor of His Majesty King Bhumibol Adulyadej on the auspicious occasion of his 5th Cycle Birthday Anniversary. 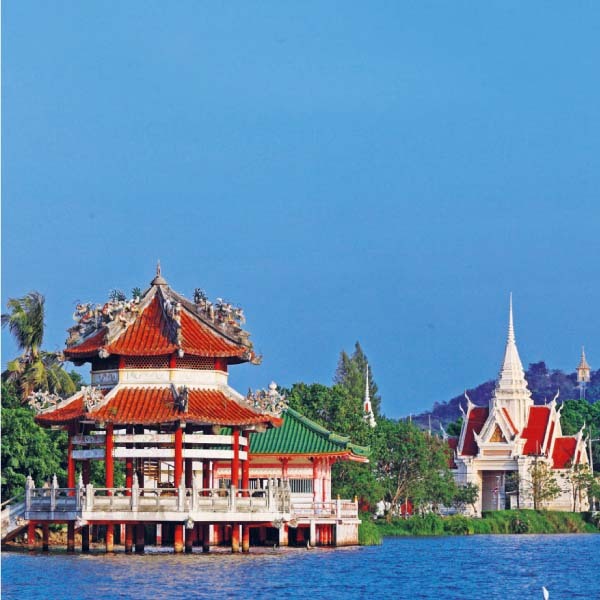 There are currently eight pavilions: Thailand’s Central Thai Pavilion, Lanna (Northern) Thai Pavilion and Isan (Northeastern) Thai Pavilion; Singapore’s Jeen Nok and Jeen Nai Pavilions; Japan’s Japanese Pavilion; India’s Indian Pavilion; and Switzerland’s Farang (Westerner) Pavilion. Pavilions of the four guest countries were granted financial support by those countries for their designing and construction in the distinctive architectural style of each country.